FLAGSTAFF, AZ — Tree-sitter James Kennedy watched from 80 feet above as 2 supporters, who had locked themselves to Snowbowl pipeline equipment to protect James’ “lifeline”, were arrested. At 7:00AM, Snowbowl workers began recklessly moving the line that tethers Snowbowl equipment to the tree-sit platform. At 1:00PM both supporters were arrested by Flagstaff Police. The two community members who were arrested face trespassing charges. Donations can be made for jail support at: www.protectthepeaks.org. A rally & march was held tonight starting at Flagstaff City Hall at 5:00 PM. 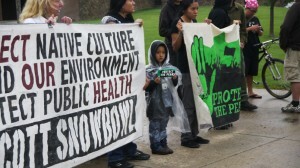 Community members walked through Thorpe Park to the nearby tree-sit site to rally, drum, sing, and express support for the tree-sitter defending public health and the Peaks. 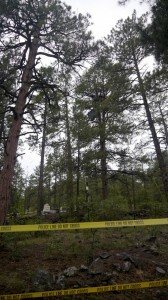 The tree-sit was initiated yesterday to block construction of pipeline that would transport 180 million gallons of sewage effluent from the City of Flagstaff to Arizona Snowbowl for snowmaking on the San Francisco Peaks. Arizona Snowbowl would be the only ski area in the world to use 100% wastewater for snowmaking. The treated sewage effleunt has been proven to contain pharmaceuticals and hormones and more recently to contain Antibacterial Resistant Genes. The San Francisco Peaks are considered an ecological island and held holy by more than 13 Indigenous Nations. 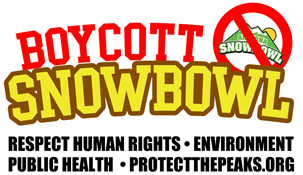 – The City of Flagstaff rescind the wastewater contract with Snowbowl! – An immediate moratorium on the City of Flagstaff’s use of treated sewage effluent in public spaces where any person may come in contact with reclaimed wastewater, until new research and technology is available to mitigate long-term environmental & community health risks. -The use of public water in this desert climate of Flagstaff with only a projected 25-38 years of water left for people’s consumption, should be cleaned and used for people to drink, not for a private corporation to make a profit. -President Obama fulfill campaign promises to protect human rights and sacred sites.